Engage with online comments on your own terms. After writing my second opinion article for The Dartmouth, I received my first Facebook response. I’ve been looking forward to this day. 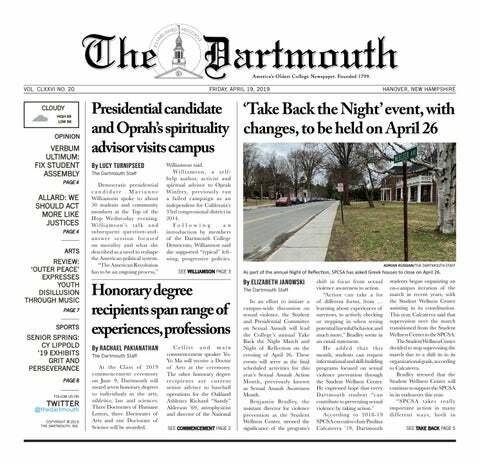 Before applying to The Dartmouth as an opinion columnist, I’d read many of the student-written articles and found myself seriously thinking about the issues raised, (the majority of the time anyway). This experience is part of the reason why I wanted to become a columnist; not just to find an outlet to express my ideas or to improve my writing skills, but also to get people to start thinking. When I did publish my first piece, I was astonished that people read what was in the school newspaper and excited by the notion that what I say would actually be read by others and potentially have some sort of impact. As my eyes scrolled down the pages of various articles, they were immediately drawn to some of the Facebook comments that were written in response to those particular articles. They’re pretty hard to miss. Some were short blurbs of retaliation, others well-thought out and civilized responses. Some were straight up rude, which I guess will get easier to deal with given the increasing ease one has to say anything online without real repercussions. In my estimation, many of them were written by adult white males who either no longer or never went to Dartmouth. I noticed that many of these comments were left unanswered by the author, and understandably so. Sometimes, an author just doesn’t want to respond to someone who appears to be misguided, doesn’t seem to have all the facts, is uncivil, is just trolling around on the internet or, the worst in my opinion, is so staunch about their beliefs that they are unwilling to consider even a nuance of their pre-existing belief, let alone ideas that directly contradict theirs. But while some people may write them off as people not to be engaged with, I find beauty in the democratization of new ideas seen in this discussion forum. Just look at what happened with Ryan Spector’s article “You’re Not Tripping” this past winter. I have opinions about that piece that I’ll spare for another time, but I will point out that, at times, the debates that took place online and in school seemed like they were going nowhere. At the very least, there wasn’t enough room for all speech because of the backlash; for many, furthermore, it was a personal offense to a struggle that they have dealt with in their own lives and the subject was too sore for debating. But Spector’s article got people to talk. I like to take people seriously, sometimes to a fault, for no other reason than the fact that I like to hear what other people think and stack up their arguments against my own. Perspective is something I think should be fluid with the more knowledge gained. That, I feel certain, is not something controversial among most Dartmouth students or anyone who likes to say they’re open-minded. I like to say I’m open-minded and a bit of a risk taker, and I couldn’t just ignore an opportunity to put my money where my mouth is. So I bolted through a closing door and did a bit of a Facebook profile search on my first commentor (technology is real scary nowadays, huh? ), and did not find him to be the most agreeable. But I responded anyway. The comment seems to have disappeared for now, but I’m sure and even hope that there will be more in the future. Though writing is mainly an outlet for expressing my thoughts, as an opinion writer, it is my task, if not my obligation to have readers reconsider their opinions, or at least have them earnestly think about the issue, and to chip away at our natural proclivity for confirmation bias. In turn, as an ideal debate or discussion would go, other well-constructed arguments with different perspectives may convince me otherwise. And I want to be convinced. Everyone is ignorant to some degree but who wants to stay as ignorant as they started? In the age of social media, it seems like there aren’t as many civil debates as many of us would like, but the online comments in opinion articles are a small, important step toward getting there. No one can change everyone’s beliefs for a variety of reasons; differences in perspectives, morals, religions, personal experiences and demographic so engage at your own discretion. But if the subject really matters to you, I think there’s more to gain in discussion than there is to be lost. To existing Facebook commenters, I say this: I’ll consider your perspective with a side of light humor, but I’ll have to pass up the discourtesy.